If you read my post earlier this week, you know that Misha had to wear the hood of shame for a couple of days. She injured her paw, well, just the toe on her paw. It’s all better now and she’s free…FREE! The first thing she did was start licking her paw. I had to take measures to keep her distracted. I bought her first Kong toy not too long ago. They make a small size perfect for an 8 lb. dog. You might be surprised that this is my dog’s first Kong classic toy. I bought one for my previous dog, Sierra, but she never played with it. I never thought of buying one for Misha until I saw they have this cute little size made just for small dogs! As you may know, Misha loves peanut butter. This was a perfect oppotunity to give the Kong a try and reward her for wearing that darn contraption. I got a teaspoonful of peanut butter. Then, I rubbed it on the inside. Note to self: do not push the peanut butter all the way to the small hole. Misha tried to chew that hole off to get to the peanut butter. She quickly figured out that it was easier to lick the food out of the big hole than to chew the other end off. As you can see, my efforts to limit it the dog bed failed. I didn’t want peanut butter and slobber all over the carpet. Next time we’ll take it to the floor. Misha will put herself into all sorts of shapes to get food out of her toys. I caught her trying to do a headstand! It didn’t work any better upside down, I don’t think. It took my dog about 15 minutes to remove all the peanut butter. That’s got to be a record for food toys and Misha! 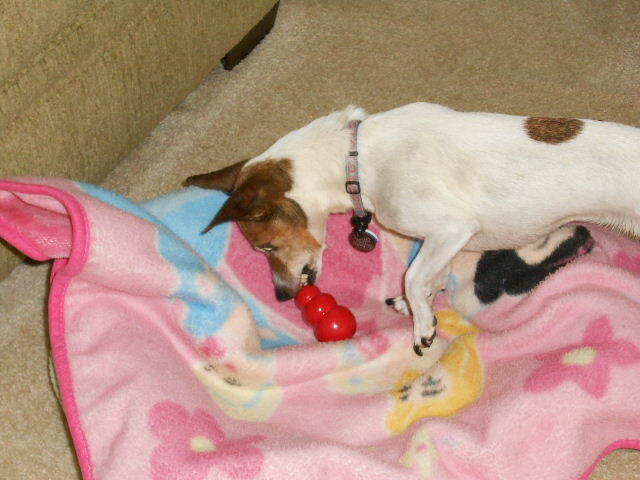 All in all, I think the Kong worked pretty well to occupy her. The small size was perfect for her small jaw. The material seemed firm enough to withstand her attempts to chew through it. I learned my lesson with pushing the peanut butter too far in. Her tongue wasn’t long enough to get it all. I ended up having to scoop out the excess with my finger. 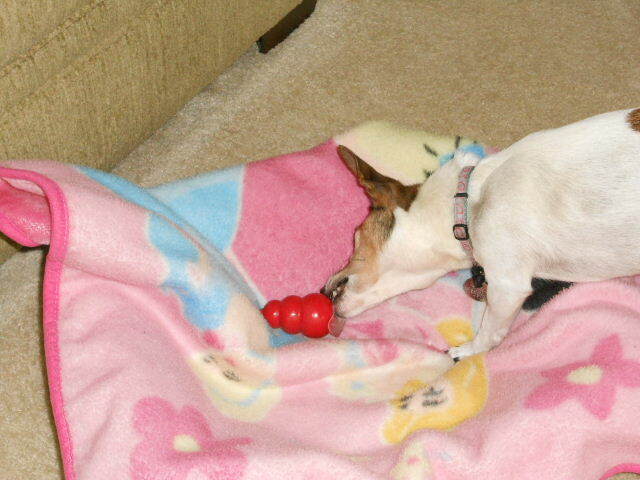 Does your dog have a Kong dog toy? 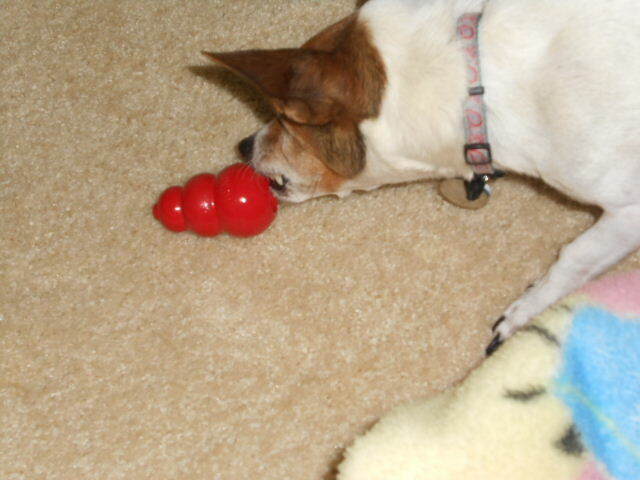 Does your dog have the classic Kong or one of the other varieties? How well does he/she like it? Kong makes a variety of dog toys. Which one would your dog like? This is a blog hop. Please visit the other wonderful pet blogs! 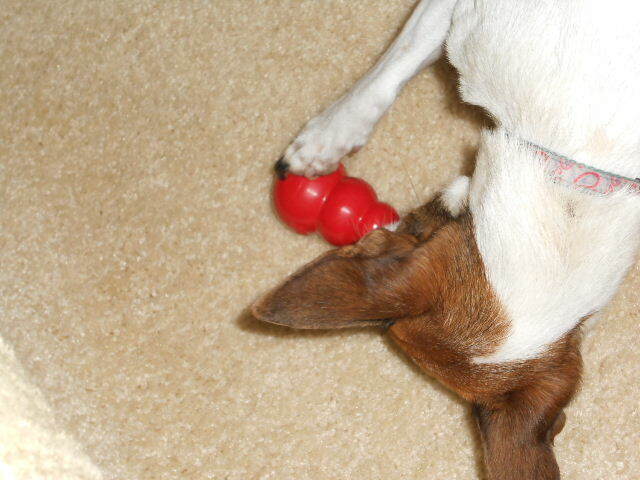 Bailie and Madison get stuff in their Kongs regularly for treats and fun. I don’t like to work for my food, so I will pass, but they love it. They are really great toys for occupying your time. I’m surprised you can’t be swayed by the food, Emma.